Our Patron: St. Nicholas of Tolentino. On a certain Saturday night while he lay in bed, St. Nicholas heard the voice of someone, a deceased friar who St. Nicholas had known. The friar revealed that he was in Purgatory and begged Nicholas to offer Mass for him and many other suffering souls so that they might be set free from their sorrows. Nicholas offered the Mass for them, with permission, all that week. At the end of that week his friend Friar Pellegrino appeared to him once again with gratitude for the great favor he had done and the assurance that a great number of the persons he had seen were now enjoying the presence of God. On another day, St. Nicholas was in Church lighting a lamp before the Blessed Sacrament. A loud voice suddenly called to him. Nicholas was startled. Thinking it was the devil who wished to tempt him as he so often did, instead, it was his own blood brother, Gentile, who had died two weeks previously and now was informing him that a great miracle had occurred: The greatest of all miracles. The salvation of his soul. "Do not doubt, Nicholas, I am your brother, Gentile. 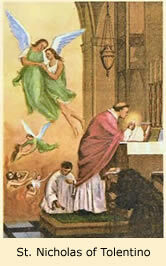 Your prayers and your acts of penance have saved my soul from certain damnation." St. Nicholas is recognized by the Church as the Patron of the Holy Souls by the Church.